Located on Bass Road in North Macon, within Providence Subdivision, Carillon Park at Providence contains New Homes that are 2550 – 2650 Square Feet in Size. All Homes have Main Level Master Bedrooms, 4-5 Bedrooms and 3 and 1/2 or more Bathrooms. Providence also has a Pool, Clubhouse, Playground, Walking Trail, and Tennis Court that are available for use through Carillon Park. Custom Features include Granite Counters, Custom Cabinetry, Travertine Tile and Hardwood Floors, Pella Windows, Covered and Screened Outdoor Patios with Fireplaces, Brick, Stone and Hardie Board Exteriors, and Many other “Standard Upgrades.” These Homes contain everything you would expect in a $500,000 home starting at $299,000. 363 Carillon Lane, Macon, GA 31210 - SOLD! 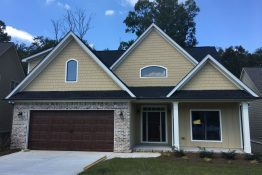 361 Carillon Lane, Macon, GA 31210 - SOLD!